A minimally invasive surgery with little to no recovery time. Also referred to as microphlebectomy, ambulatory phlebectomy is a minimally invasive outpatient vein removal procedure used to treat bulging varicose veins closest to the surface of the skin. What Can I Expect During Ambulatory Phlebectomy? Ambulatory Phlebectomy is performed under local anesthesia without sedation. 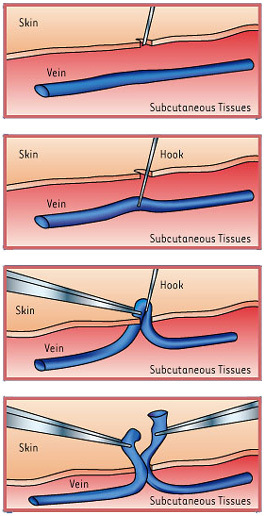 Following administration of local anesthesia, multiple 2-3mm microincisions are made for the removal of vein segments. No stitches are required for these incisions. What Can I Expect After Ambulatory Phlebectomy? Patients can resume standing and walking immediately following the procedure, and return to work and light activity the same day. Compression stockings are recommended for one week following vein removal to aid in the healing process. Am I a Candidate for Ambulatory Phlebectomy? Schedule a consultation to determine if ambulatory phlebectomy is right for you. A vein specialist will obtain your full medical history and perform an ultrasound analysis of your legs. If ambulatory phlebectomy is determined to be the best course of treatment for your condition, a highly experienced interventional radiologist will discuss the procedure and address any questions or concerns you may have. What Are the Risks & Side Effects of Ambulatory Phlebectomy?